This is what my wife looks like at 13 weeks into the pregnancy. She is eating a lot of fruits and is always tired. She is now at 134 lbs, up by 4 lbs from a month ago. We haven't actually measured her waistline yet but will soon enough in order to get a baseline for when her tummy starts to show. 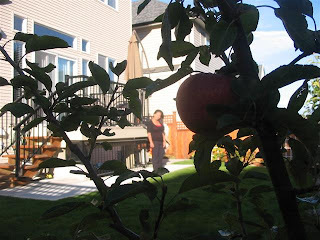 Here is a nice shot take from behind our one red apple in the backyard. Nice and juicy apple. I can't get myself to harvest this fruit seeing as it's the only one in the tree. Can you see Grace in the background? 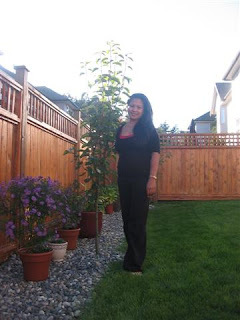 This is how tall our pear tree is in the backyard.